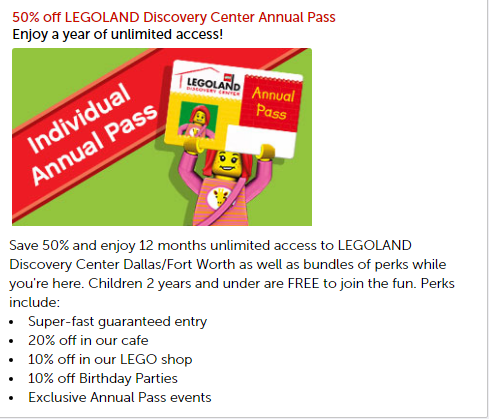 LIMITED TIME OFFER: 50% Off Annual Passes At LEGOLAND Discovery Center Dallas/Fort Worth! For a limited time you can get 50% off Annual Passes at LEGOLAND Discovery Center Dallas/Fort Worth! 4D cinema, Kingdom Quest laser ride, Merlin’s Apprentice, LEGO City: Forest Pursuit Driving School… and more!